Even monkeys heed the call to adventure every now and then, especially when an evil king steals their favorite toys, making them go very sad. The only way to stop the endless flow of tears is by embarking on a Monkey GO Happy Adventure to get the toys back. Following the changing cursor, click on the screen to interact with objects and characters as you explore the kingdom. After you find helpful items, drag them from your inventory onto necessary spots to solve puzzles, working your way into the castle and freeing the monkeys' playthings from the regent's well-guarded vault. This latest installment of Pencil Kids' whimsical point-and-click puzzle series doesn't depart much from the formula but there are a couple notable differences. 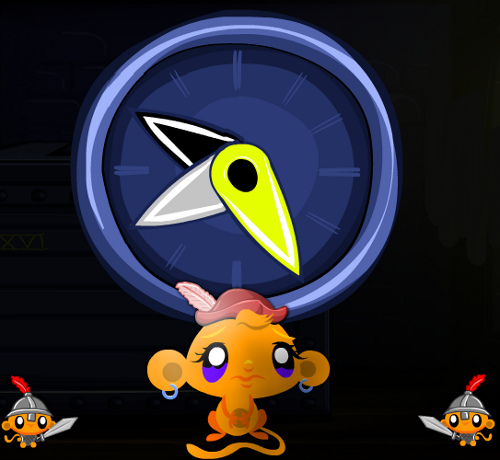 Rather than a series of individual scenes or a need limit the number of clicks, your goal is to complete the singular quest to find the toys as quickly as possible. A high score isn't the only reason you want to be fast: the sooner you rescue the toys, the quicker you'll turn weeping to joyful leaping. As long as you don't get squeamish over stinky spider poo, all this is a simple thing with rather straight-forward tasks and only two codes to hinder your progress. Fame, glory and a fortune? Maybe. Happy monkeys? Definitely. 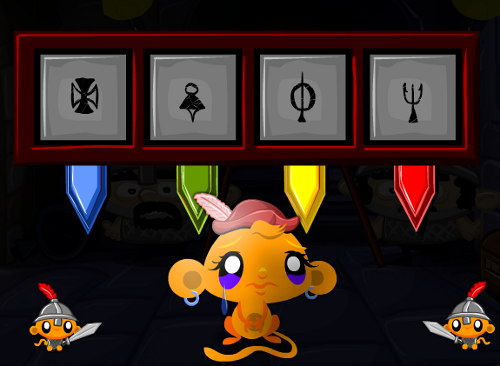 Monkey GO Happy Adventure Walkthrough now available! Grab the SMALL FLY that's buzzing around the sack in the corner. Click on the butcher to find out price of the ham leg; come back when you have 10 coins to buy it. Pick up the EMPTY JAR in the corner. Learn from the shopkeeper that you need 10 coins to buy carrots. Go forward to scene 2. Click on the dog and read the sign on the well: put something in it to make it bigger. Go left to scene 3. Click on spider to see it wants something, but currently nothing in your inventory works. Go right two times to reach scene 4. Pick the WEIRD BERRIES from the bush. Try to grab the gingerbread man from the house, but it won't let you near it. Go left then forward to scene 5. Make a note of how that guard drinks from his mug, that the castle gate has a red keyhole and of the markings on the flags along the castle's wall. Go right to scene 6. Click the large ant to see it wants a gingerbreadman cookie. Return to scene 1 by going left twice and then down. Buy the HAM LEG by dragging your coins to the butcher. Buy the CARROTS by dragging the rest of your coins to the shopkeeper. Leave the shops and go forward to the Growing Well. Give the HAM LEG to the dog. Open the well and put the SMALL FLY (from inside the butcher's shop) inside it. Now you have a GIANT FLY. Go left to the spider cave. Use the EMPTY JAR to collect some SMELLY POO. Give the CARROTS to the horse. From the village center, go forward then right to return to the gingerbread house's forest. Go right, forward and then right again to return to the ant hill. Give the GINGERBREAD to the ant. Go left to the front of the castle. Put the WEIRD BERRIES in the guard's mug. He'll drink them and fall asleep. Next, use the RED KEY to unlock the castle. Click the door to open it and go inside. Use the JAR WITH SMELLY POO to scare away the guards. Pick up the STRANGE DIAL in the corner below the torch on the left. Enter the correct code to unlock this chest. Get the TINY GOLD KEY. Put the tiny gold key into the well to make a HUGE GOLD KEY. Go forward, re-enter the castle, and use the HUGE GOLD KEY to unlock the inner door. Opening the Toy Vault: Victory! Once inside the final room, put the STRANGE DIAL (found in the first room of the castle) on top of the large vault. Moving first the black, then the white and finally the yellow clock hands, enter the correct settings on the dial. With the toys freed from the vault, your adventure is a success. Congratulations! I had to disable adblocker so this game would load. I've never had that happen before. I meant enable, sorry. It played an ad and then the window vanished and nothing happened. I refreshed twice to no avail and then turned my adblocker back on and it worked. I disabled it again after I played it. *Two* video ads before the game starts? Automatic one shroom. Why wouldn't you guys want Jayisgames to get paid? They're providing a valuable service. I adblock a bunch of stuff, but these guys are on my whitelist. "Why wouldn't you guys want Jayisgames to get paid?" I do want them to get paid popjunky, that's why I whitelisted them after they asked everyone to. I had to turn adblock back on so this game would run and turned it off again after I played it. It wasn't a big deal but I thought I'd mention it because if it happened to everyone or started to happen frequently then that would be bad for JIG. And voting based on ads is just low. I had the exact same experience as Dandy--I've whitelisted Jayisgames, but this game would NOT load until I had re-enabled Adblock. I tried at least four times with Adblock disabled and it locked up every time. I tried in both Firefox and Chrome, with Adblock running and Jay white listed and had no problems loading at all. Also I only got one add not two, so I am not sure what is happening to you guys there. Maybe it is regional ? Also, Tenzhi, I am surprised at you - rating a gae for an ad problem - really ? Absolutely. A game that throws up an ad video between every level, for instance, will get a low rating from me. I don't mind a single ad at the beginning, provided it has a built-in volume control if it is a video. But two video ads before the game even starts? That's just annoying. Note that I did not, in fact, avoid playing the game. However, if I tried to play a game and found it unplayable for whatever reason - be it bugs, game balance issues, or ads - then I would give it an appropriately low rating. If we the gamers have to accept ads as part of the gaming experience, then, like any part of the game, they should affect the rating. Thanks for the note, and thanks for checking. I'm using Chrome, so not sure what the deal is.